But the cloud has no such limitation. While it is still someone else's computer, the cloud can scale infinitely according to your needs. At mabl, our mission is to make QA ops-less and hassle-free while being able to scale to meet the highest software delivery demands today. 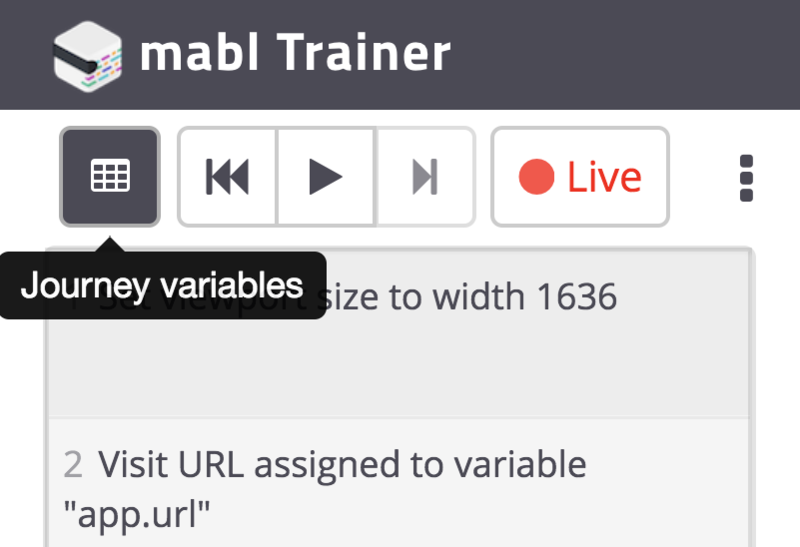 That's why we want to show you three ways to easily scale your tests to infinity and beyond using mabl: using Plans, using Reusable Flows and using Data-Driven Testing tables. Plans and journeys are mabl-speak for test plans and test scripts. 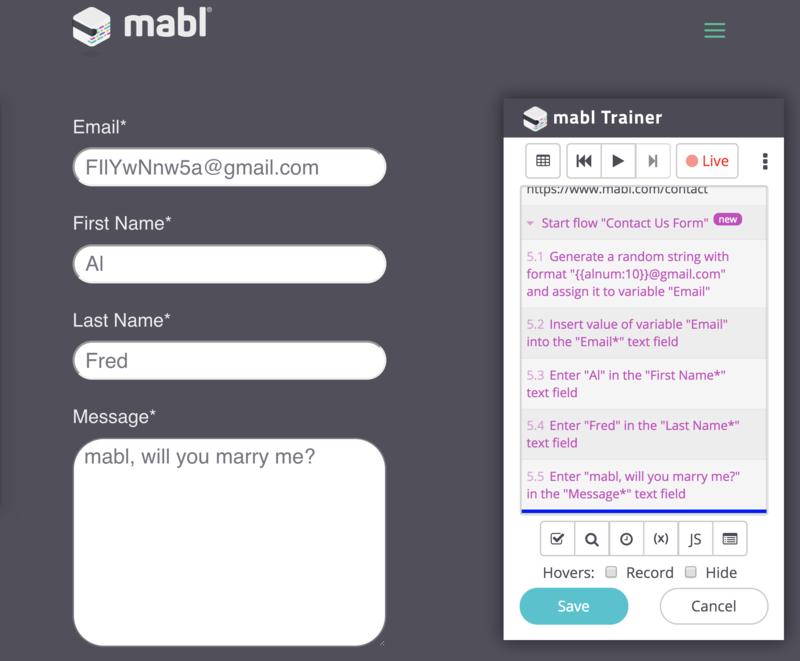 Test creation with mabl is completely script-less - we believe that test automation should focus more on the end-user journey rather than the test script creation process. That's why we call mabl tests, journeys. 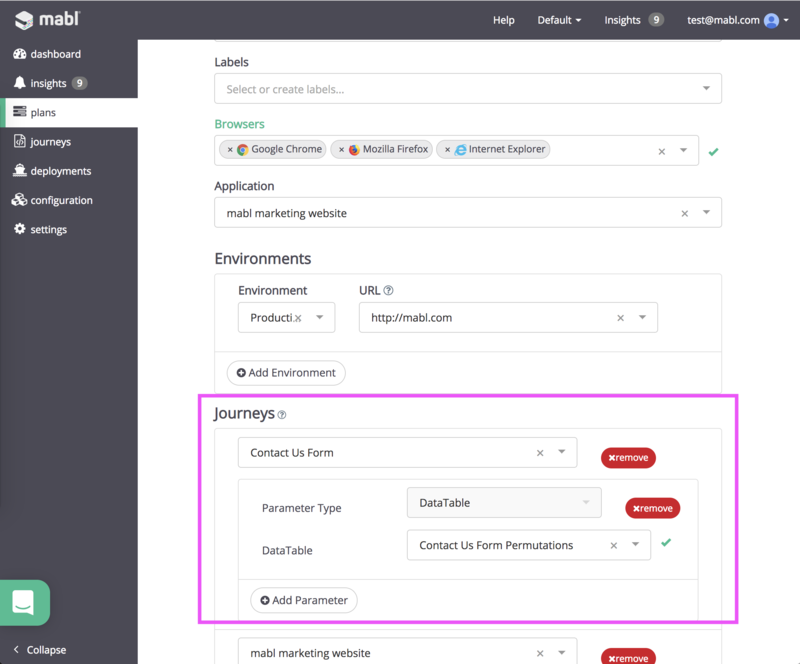 Journeys are independent from any environment definitions, such as target URL, browsers, screen-size, execution schedule, etc. Plans package all the environmental information mentioned above, so that any number of journeys can be run against any combination of environments. This gives you the flexibility to run the same journeys on the same target application across different environments, such as Staging and Production, without having to recreate the journey from scratch. 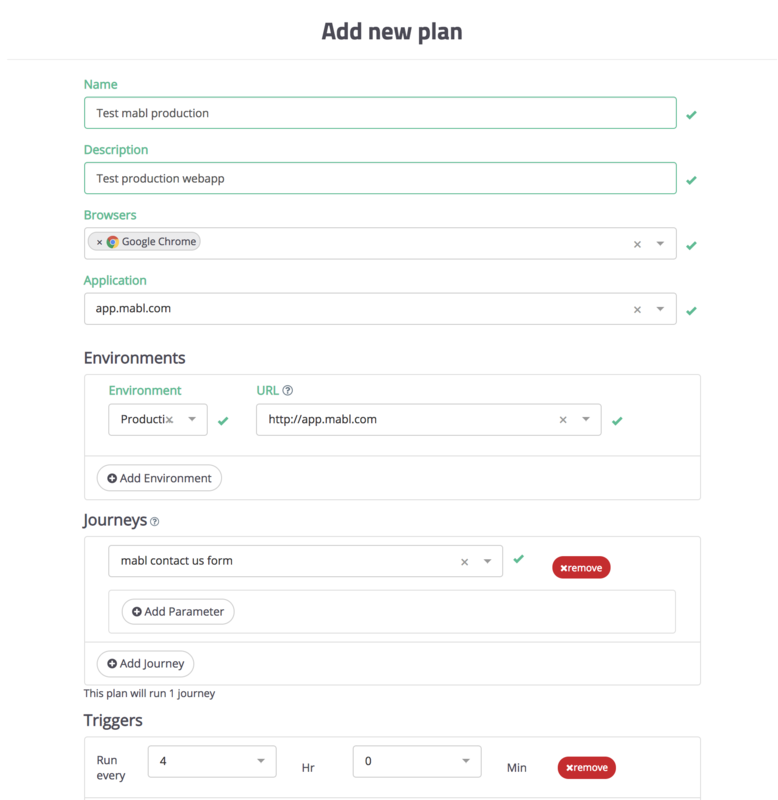 Here's an example plan that contains one journey, set to execute the journey on Chrome, against the target application in Production every 4 hours. As a result of this plan, one test will be executed. Nice! That was easy. Now let's move on to reusable flows, which will bring us to the topic of configuring journeys. If you have a common sequence of steps in your journeys, they can be bundled into reusable flows, which can then be inserted into any other journey, too. A journey therefore can be composed of primary (non-reusable) steps and reusable flows. Remember that Contact Us Form journey (first image) way at the top of this article? We're going to recreate that journey using a reusable flow. 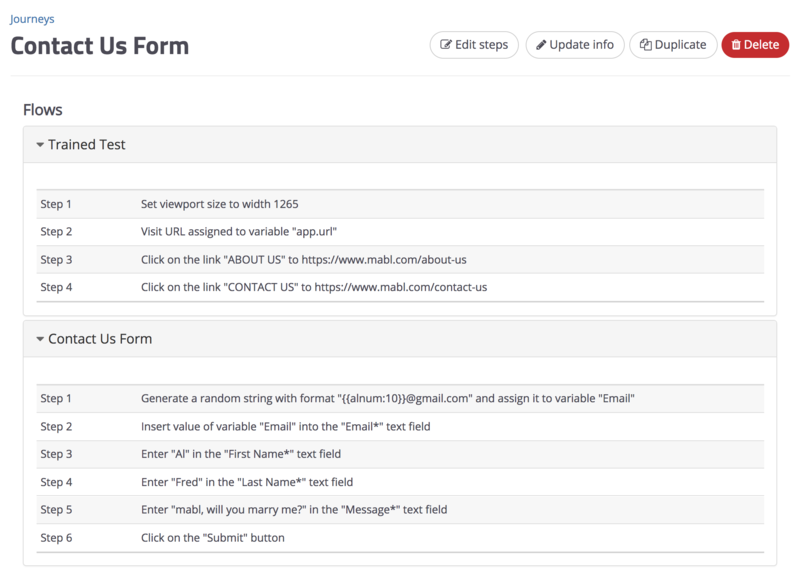 I'll name the new reusable flow "Contact Us Form", and everything that I record while in this reusable-flow-mode will show up in purple. Tada! Reusable flows are an easy way to extend your journeys to make them super flexible, and scales well with changes - if you update a reusable flow, changes will propagate to all journeys containing that flow. What we need to get started is a Data Table. There's a few ways to do this. Option one is to create one during the initial recording of the journey. Just click on the Journey Variables button in the top left of the trainer. 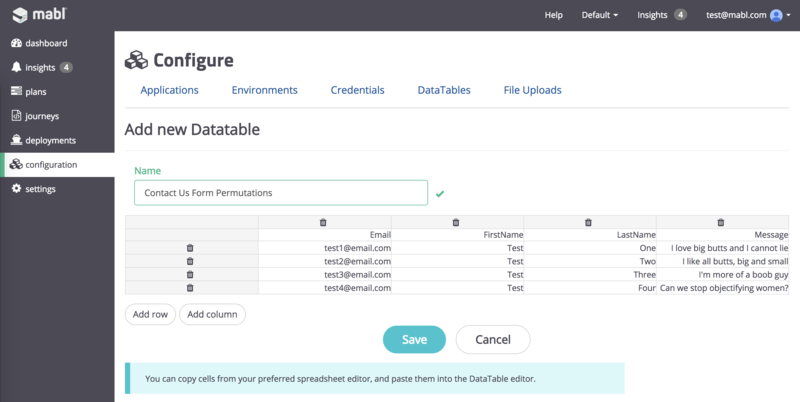 Here, you can set the Default values (which will be the first permutation of your journey), and you can add the rest of the permutations later in the Data Table configuration view (shown below). You can manually type the values into the table, copy and paste from a spreadsheet, or upload a CSV. And that's it! 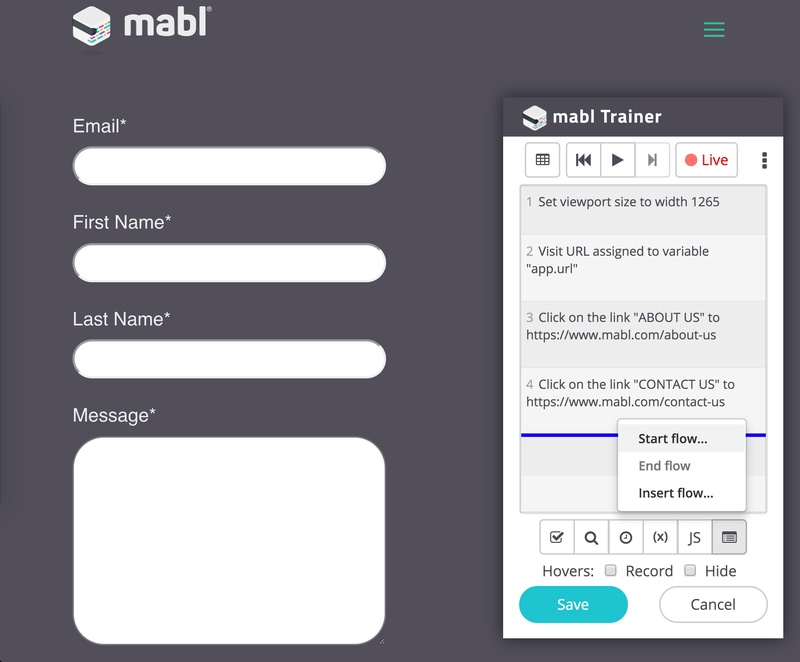 You can view the test output to see every action mabl takes along the journey, including inputs used. Data-Driven Testing is a great way to stay organized, and keep your tests versatile. 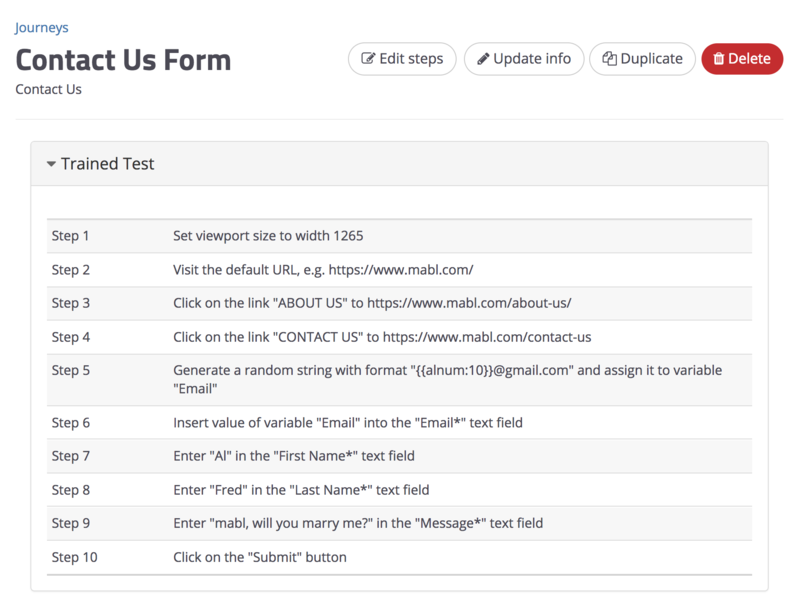 We've added thousands of rows to our data tables when testing mabl's Data-Driven Testing functionality internally. 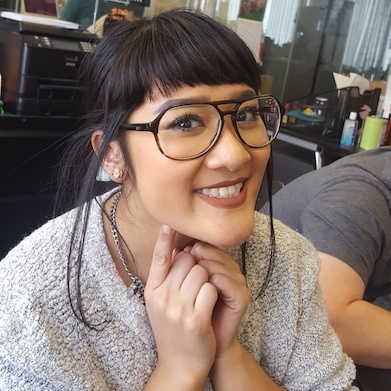 Go ahead and put us to the test with your own test suite! Try mabl out for free.